A short video with Francis Chan expounding on church as it is, and how it should look as presented in Scripture. IS GOD PLEASED WITH OUR CHURCHES? You have to listen to this message from Francis Chan – just 4 minutes on the “last days” church. IF ALL YOU HAD WAS SCRIPTURE, WHAT WOULD CHURCH LOOK LIKE? Francis Chan is urging the rising generation to reengage the Scriptures about how church is done, stressing that the U.S. model has gotten many things wrong, even though motivated by good intentions. “I got tired of hearing my own voice,” Chan said, explaining why he stepped down, something he writes about at considerable length in his latest book, Letters To The Church. Yet because he did not give all of the reasons for why he left, people started making assumptions. Through several conversations with his elders and his own journey of poring over the Scripture about what the church ought to be, he came to the conclusion that he could no longer abide the status quo. He tried to make some changes he thought were necessary but was unsuccessful, he explained. Compounding the struggle further was the success of his books Crazy Love and The Forgotten God and the proliferation of opinions on social media about what he should doing and be preaching. “It was a confusing time. I just really didn’t know what more I could do for the church,” he said. “And as my wife and I prayed. Both of us just really sensed there’s something else.” He thought he would be positioned at this church for his entire life; he always respected other pastors who did so. But he continued to sense that the Lord had something new for him so he figured he had better obey that and move on. In Letters To the Church, he addresses the credentialed, consumerist, and expensive economic model in which America does church. “I would be going against Scripture to say that ministers can not be paid by the church,” he told Relevant. But in a lot of countries, that is not the way it is, he pointed out, and you must do what is best for the Gospel not what is best for yourself. Somehow, you have millions and millions of believers in China, and it wasn’t about all these paid clergy [where] that was their business. And even in the inner cities of America where most of those pastors are bi-vocational. In San Francisco, one of the most expensive cities in the United States, none of the pastors in Chan’s network of house churches are paid. They do not have a budget like most churches do; all the money they take in goes to the poor and other mission-related activities. I was reminded by this verse in Judges 6:1, “And the children of Israel did evil in the sight of the Lord: and the Lord delivered them into the hand of Midian seven years“, just how often Israel was delivered by God into the hands of some foreign nation for judgement. What about the church in our day? Is God delivering an apostate church into the hands of the enemy for judgement? God’s word reveals that there will be apostasy in the “last days” church and that certainly is the case with many of the denominational churches compromising with the world’s values. 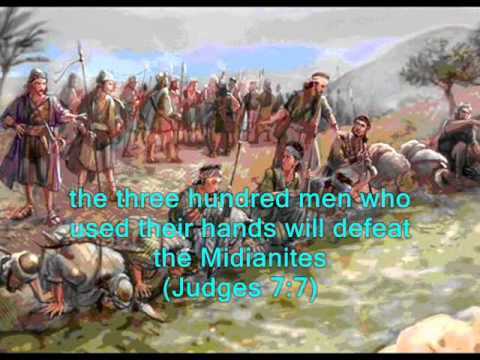 However, just as in the days Israel was delivered into the “hand of Midian”, God had his redemptive plan prepared and He chose Gideon a most unlikely candidate to achieve His purposes. Who are the Gideon’s, God has chosen in our day? Just as Gideon winnowed the wheat from the chaff, God winnowed Gideon’s army. God winnowed down a fighting force from 32,000 to three hundred. Those who were “afraid and trembling” were asked to leave first. Cowards go first in Revelation also. 22,000 departed leaving Gideon with just 10,000 now to fight 120,000…outnumbered 12 to 1. God still said, “The people are still too many; bring them down to the water and I will test them for you there.” Judges 7:4. God then rejected another 9,700 men with only THREE HUNDRED remaining. What a crazy story but we are meant to learn from it. 2. God wants us to develop our faith and trust in Him as did Gideon. David is another great example. Listen to David, “The Lord is my strength and my shield; my heart trusted in Him, and I am helped; therefore my heart greatly rejoices, and with my song I will praise Him.” Proverbs 28:7 When your heart trusts in the Lord, you can expect help. God only needs 1 person to make 1,000 flee and 2 people to make 10,000 flee. It’s never been about “numbers” with God. Who are the leaders in the church today who are bold and courageous, who understand that the battle is the Lords and numbers aren’t a problem? They are those who believe God’s inerrant Word, know we are in the “end times”, know God’s call on their lives and get on with the job, trusting God for the outcome. We need to work with these anointed leaders, confident in our own role in God’s “end times” plan. Watch this 15 minute presentation by Peter Sutton on church. What can happen when pastors realise that they are just part of God’s church and the denominational barriers come down. People don’t go to church, they are God’s church, wherever He has placed them in the marketplace. Only then, does the church start to impact communities and cities.